Effective January 1, 2019 we will be increasing prices between 3 and 5% across the board on our all products. The main driver is increased freight costs caused by the lack of drivers and reduction in hours that can be worked which have driven up our freight costs. 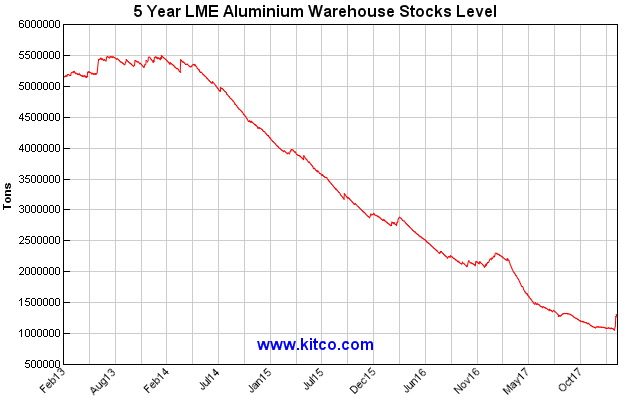 This is in addition to increased reel, pallet and lumber costs which have risen throughout the year. This is independent of the tariff increases which have happened throughout 2018. We are making every effort to minimize our freight costs primarily by increasing the number of warehouses throughout the U.S. that we can stock by the truck load and use local shippers to reduce overall freight costs as well as the possibility of damage as the product is not cross docked while moving across the country. In 2018 we opened up a new warehouse in Odessa, TX and will be opening a new warehouse in Tampa, FL in addition to the current Rep warehouse inventory already there. Priority Wire & Cable is proud to announce the hiring of Ryan Garner as our new Director of Industrial Sales. In this role Ryan will be leading the development of our Industrial Sales Division. Ryan has been in the Wire & Cable business for twelve years initially with Omni cable and for the last two years with Lake Cable. He is very knowledgeable in the Industrial Wire and Cable space and we look forward to him joining our Management team. We are also pleased to announce the addition of Shantelle Wischnewsky to our Industrial Inside Sales Team. Shantelle has over twelve years of experience in the Electrical industry with past experience at Rockwell Automation and most recently at Omni Cable. Celebrating our 25th year in business, Priority Wire and Cable has grown into being a premiere supplier of wire, cable and electrical products; selling exclusively to distribution. Best in class service and extensive inventory provided from our 15 North American distribution centers are available to all of our valued distributor partners for next day delivery in most cases. For more information on Priority Wire & Cable, please visit www.prioritywire.com or call us at 1-800-945-5542. Priority Wire & Cable is proud to announce the appointment of Mountain States Agency as our Manufacturer’s Representative Agency for the State of New Mexico, El Paso, TX & Durango, CO.
Mark Delaney & Stephanie Rodriguez have built a highly knowledgeable sales and technical staff, which has been supporting New Mexico, El Paso, TX and the Durango, CO markets since 2012. We are excited to partner with an industry leader such as Mountain States Agency and we look forward to working together, to provide superior solutions for our distributor partners. Priority Wire & Cable is proud to announce the appointment of Coresential as our Manufacturers Representative Agency for the State of Florida, excluding the Pan Handle. Coresential has been supporting the Florida market since 1987 and Joe Tumlin, James Yore & Robin Conway have built a highly knowledgeable sales and technical staff. We are excited to partner with an industry leader such as Coresential and we look forward to working together, to provide superior solutions for our distributor partners. Due to the fantastic support of our distributor partners, we have outgrown our warehouse. The new distribution center is located at: 6300 Atlantic Blvd, Norcross, GA 30071. This 106,531 sq. ft. state of the art facility has more space, more machines, more colors, more of everything that our distributor partners and their customers have come to depend on Priority Wire & Cable to have available for Will Call or Same Day Shipment! 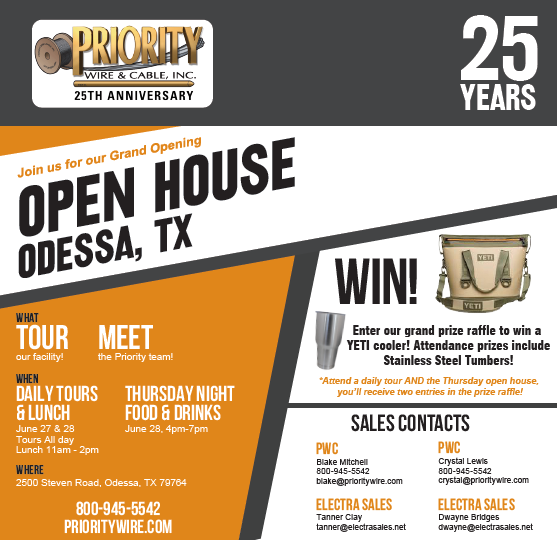 Visit our website at www.prioritywire.com to learn more about this facility and Priority Wire & Cable. Dorothy brings 25 years of solid sales and marketing experience in the Electrical Industry, working at the national level in manufacturing with Alcan Cable and IDEAL INDUSTRIES, and in distribution with WESCO. For the past five years she has served as principal business development consultant with INCEPT Strategies. In her new role as National Sales Manager, Dorothy will be responsible for continuing the growth of our sales in Canada, and will manage our Sales Representative network and Inside Sales team. We look forward to her leadership in working with our channel partners and end-user customers. Dorothy will be reporting to Robert Strahs, Vice President National Accounts & Marketing – USA. Priority Wire & Cable Inc was founded in 1993 in Little Rock, Arkansas and is a modern manufacture with the majority of our sales being Priority branded products. We also fill out our product offering with specialty wire and cable products, sold generically or under other industry leading brand names. This allows us to provide a product offering and service level unmatched by other industry factories or brokers. We sell only to wholesale distribution and provide same day shipping from our fifteen North American distribution centers (fourteen in the U.S. and one in Toronto). With a total of 1.7 million square feet of warehouse space we have industry leading fill rates and next day delivery to most customers. 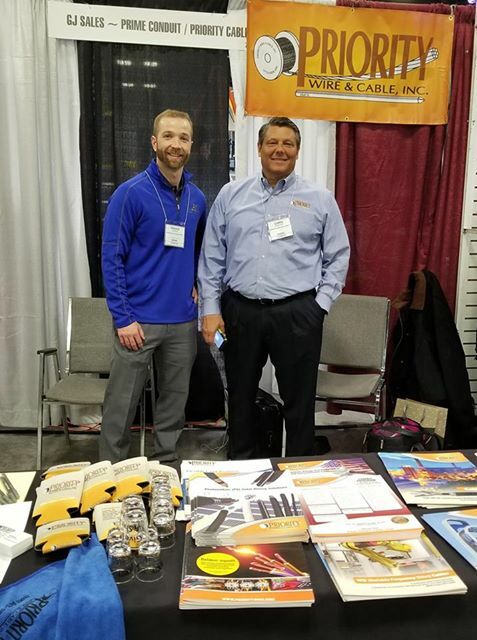 If you are a current customer, thank you for your business as you have helped us become the fastest growing wire and cable supplier in the industry. If you are a potential customer, we hope you give us a chance to prove why we are growing so fast. If you are an end-user or contractor, we hope you are asking for our product by name. We expect to see industry price increases on these products in the 20% range as purely domestic manufactures had previously incurred 10% tariffs on raw material such as Aluminum rod and steel strip and pure Chinese importers will incur the full 25% tariff. We have also been experiencing strong demand for our products and with the new tariff increases we project that the market may see reduced supply, thus prices are likely to rise. Due to our significant inventories and global production facilities we expect to maintain our high service levels. However, we will also be initiating price increases in the 10 to 20% range effective immediately. We will watch market conditions closely and react as needed to what could be very volatile pricing in the coming weeks and months. 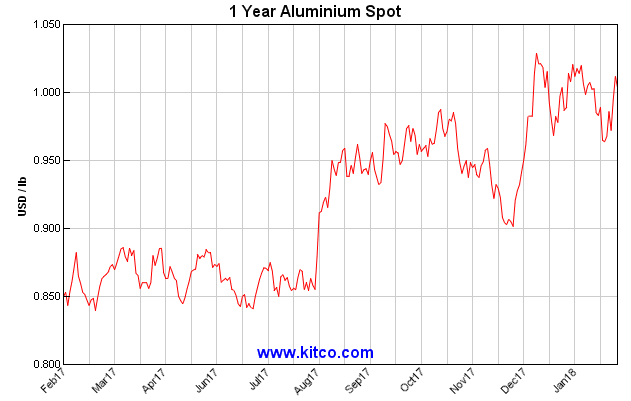 Due to the continued rise in aluminum costs, Priority Wire & Cable will be issuing a price increase for aluminum building wire and aluminum MC cable effective February 26th. This increase will be approximately 8-12%. - All open quotations with expiration dates beyond February 23rd are now valid until close of business Friday February 23rd. - Backordered material already on order prior to this announcement will be honored at the pricing the order was entered. - To receive our current pricing on new orders for immediate shipment, they must be placed before close of business Friday February 23rd. Contact your Priority Wire & Cable sales team for additional information. Priority Wire & Cable, Inc. welcomes Dana Berberet as the new Midwest Profit Center Manager. Dana will be responsible for the Ohio, Michigan, Indiana, Northern Illinois, Wisconsin, Minnesota, North & South Dakota territories. Dana will be managing the corresponding inside sales teams and coordinating with our agency and distributor partners. Dana brings a wealth of knowledge to Priority Wire & Cable from her previous work experience, which included GE Supply, Callas/Kingsley Electrical Sales and Mulcrone & Associates. We are pleased to announce that Pat McClafferty has joined us as Director – Utility Market. He will be working with us to provide an increased focus on the sales and sales support of Priority Wire & Cable’s utility products. He will be interfacing and transacting directly with electrical utilities, utility distributors, as well as our Manufacturer’s Representative Salesforce. Pat’s utility background goes back to his father who was a lineman for PG&E in California. Prior to joining our team, Pat was Vice President Utility Sales & Service at Arkansas Electric Cooperatives, Inc. (AECI) where he served for over 23 years. He has also worked with Diversified Electric Supply and Graybar. In the past, Pat has served as President of the Arkansas Electrical League, President of Electric Utility Distributors Association (EUDA), and a member of the supplier’s advisory council for Utility Purchasing Management Group (UPMG). Due to the rise in commodity prices (copper, aluminum, steel and resins) as well as other cost factors we are initiating across the board price increases within the U.S. and Canada from 6 to 10% on our product lines effective immediately. All indications point to sustained or continued increases in commodities as well as other costs leading us to believe that prices will go up and stay up. Please contact your Inside Salesperson for current price and delivery.